Goodness, it is so hard to believe that Memorial Day is this weekend! Some kids are already getting out of school for the summer. Our daughter has a couple weeks left but our school system starts after Labor Day so its not quite so bad. So we are counting down the days to summer fun. Memorial Day is the kick off to summer none the less wherever you call home. We don't have too much planned for our Memorial Day weekend. We are invited to a cook-out at my sister's house but other than that I am hoping to be able to have a pretty chilled and laid back weekend. We pull out all the red, white, and blue on all the patriotic holidays. One of the easiest (and most impressive) things you can make is a trifle. They take absolutely no time at all to throw together and it gets all the oohs and ahhs whenever we serve it. 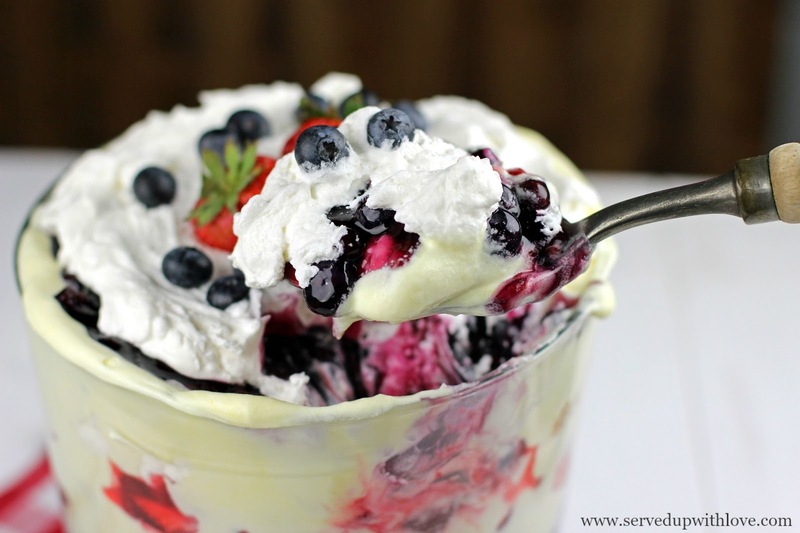 What I love most about a trifle is how easy they are to make. You can use pound cake, angel food cake, or just a plain ol' vanilla cake. Whatever strikes your fancy! If you are having just a small group, consider making individual trifles in mason jars, they are just so stinking cute. The possibilities are endless. So unleash that patriotic spirit this weekend and have fun! 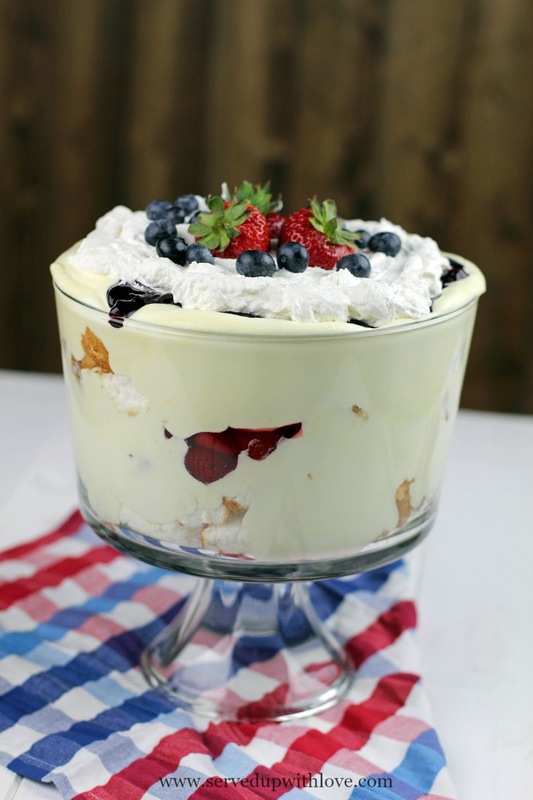 In a large bowl, mix the milk and vanilla pudding with an electric mixer. Fold in one container of whipped topping. Set aside. 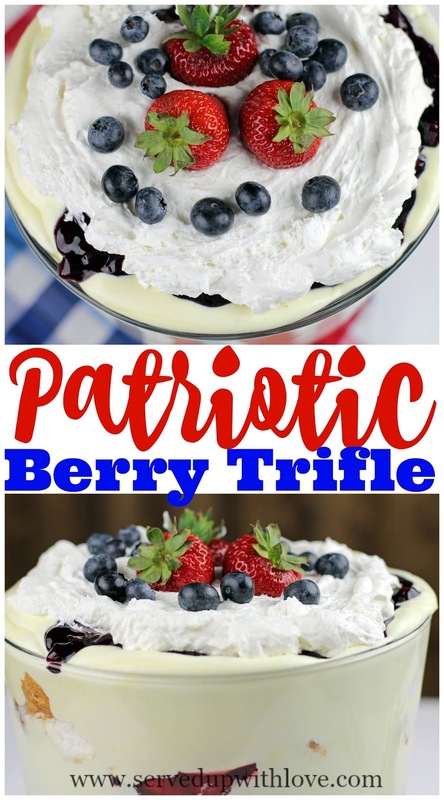 In two smaller bowls, combine the pie fillings with each of the berries. Set aside. 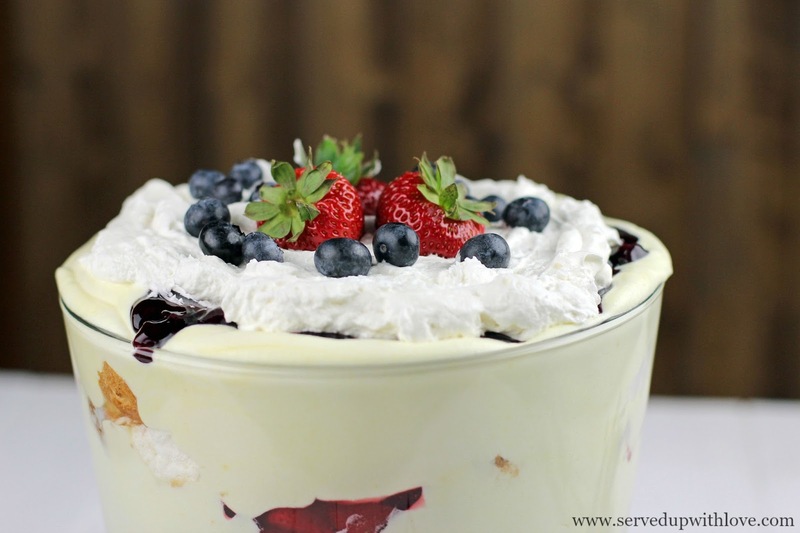 In a trifle bowl or punch bowl, add a layer of angel food cake. Next add the pudding mixer, next add the strawberries. Repeat the layers except the second layer add blueberries. Top with the remaining whipped topping and add a few extra berries on the top. Chill until ready to serve. That's beautiful, and it looks delicious!